MISHIMA, Shizuoka -- A Japanese monkey that was captured in Shizuoka Prefecture after biting over 100 people has escaped from a park, sparking a warning from local authorities. 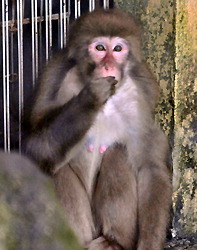 The monkey, named Lucky, escaped from Rakujuen Garden in Mishima on Monday morning. The macaque was spotted near JR Mishima Station, and some 20 city workers launched a search, but were unsuccessful. The Mishima Municipal Government has warned residents to lock their doors, saying there is a possibility the monkey could bite more people. In a news conference on Monday, city officials said Lucky escaped when a worker cleaning her cage opened an inner door without locking the outer one. At first she remained beside the cage for a while, but workers failed to catch her. "It was a human error," Rakujuen head Shizuo Sugiyama said in an apology. Lucky bit 118 people in five cities and one town before city workers captured her on Oct. 10 last year in a resident's home. After naming the monkey Lucky, city workers put her on display at the garden. Souvenirs associated with the monkey were sold and the garden saw an increase in visitors, but Lucky had been losing hair, apparently due to stress.